This game is based on the short novel, The Old Man and the Sea, by Ernest Hemingway. Some say that it is a Christian parable. Others say that the old man is Hemingway reflecting on his life, and that perhaps the boy is the young Hemingway. Still others say that Hemingway, committed to realism, denied any symbolism. It's a fun novel when you read it with this this mystery in mind. It would seem to drip with symbolism. This was also the last work that was published in his lifetime. This game is short. Some of the features are truncated and simplistic. It was created in a few weeks for MAGS (November 2012) â€“ a monthly classic point-and-click adventure game competition where all of the content must be created within that month. The interface is simple. 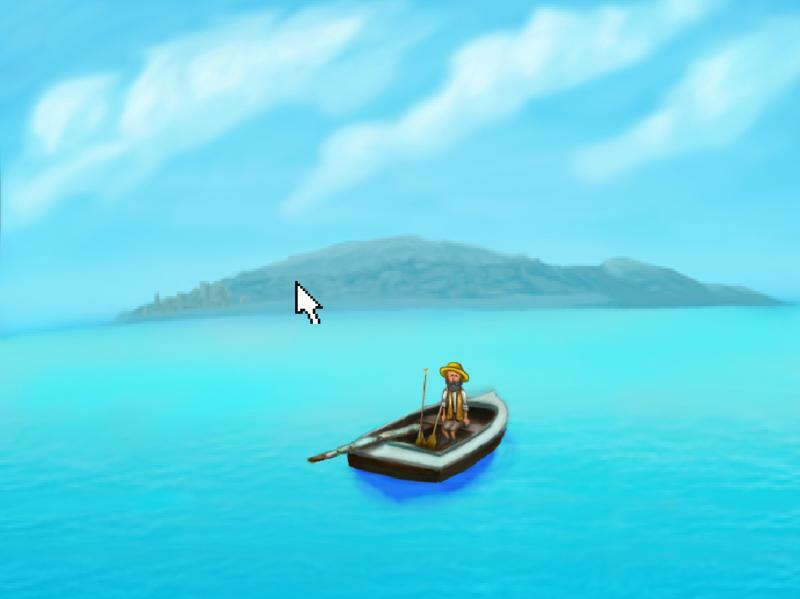 The left mouse button will either look at an item or walk to a new location. The right mouse button will contextually interact with an object, character, or item (use, talk, give). The player's inventory is accessed by looking at the player. Talking to the player will describe the current quest/puzzle, sometimes giving a hint. Although a few liberties have been taken for the sake of game-play, the best hint book is the novel. Sparks Notes provides some insight into interpretation. Both are available online. As of 1-14-2013, issues found after the MAGS deadline have been repaired. This includes a few bug fixes, improvements, a load/save feature, including a fix for the bug described in the comments below. Just to note I used can of tuna on carboy (or may have slipped and pressed the up inventory arrow) and the game froze up, had to alt F4 out of it.